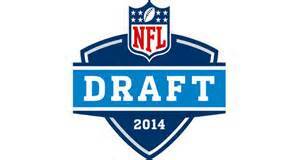 The Final Couch Coach 2014 NFL Mock Draft!!!! 1) Texans :Jadeveon Clowney DE, South Carolina – I don’t expect the Texans will make this pick .I predict them to trade down to maybe Jacksonville to get Khalil Mack. 2) Rams : Sammy Watkins WR, Clemson- The Rams strengthen their wide-out core and officially place the NFC West on notice. 3) Jaguars : Khalil Mack OLB, Buffalo- The Jags might end up getting Clowney, either way they will get a great player. 4) Browns: Blake Bortles QB, UCF- Bortles will be a project and will be Brian Hoyer’s back-up…consider Mike Evans in this pick as well. 5) Raiders : Mike Evans,WR,Texas A&M- Best available player at this point. 6) Falcons : Greg Robinson, OT, Auburn- The Falcons grab the biggest steal in the draft. 7) Buccaneers :Aaron Donald, DT, Pitt- The Bucs take a reach and grab the talented DE that is needed. 8) Vikings:Johnny Manizel QB Texas A&M- The most polarizing player in this years draft land in Minnesota. 9) Bills : Eric Ebron ,TE, North Carolina- The Bills need a play-maker & he fits the mode. Ebron will be the Offensive Rookie of the Year!! 10) Lions :Justin Gilbert CB, Oklahoma State- Cornerback is the Lions biggest hole; Gilbert makes perfect sense at 10. 11)Titans : Anthony Barr, OLB, UCLA- One of the best LB in this years draft, the former RB will make an immediate impact. 12) NY Giants : Jake Mathews,OT,Texas A&M- The biggest slide of the draft. 13) Rams: Ha Ha Clinton-Dix, FS, Alabama- Best available DB at this point. 14) Bears: Kyle Fuller,CB,VA Tech- The Bears need help desperately in the secondary. 15) Steelers :Taylor Lewan, OT, Michigan- Steelers take Lewan since Fuller is off the board, the Steelers need O-Line help. 16) Cowboys: Timmy Jernigan, DT, FSU- Cowboys take a leap to get Timmy. 17) Ravens : Cyrus Kouandjo, OT, Alabama- The Ravens also love C.J Mosley, but must make O-Line their top pick. 18) Jets: Odell Beckham WR, LSU- The Jets need to surround Geno with formidable weapons. 20) Cardinals : Derek Carr QB , Fresno State- Project QB to sit for a year or two while Carson Palmer enters the twlight of his carrer. 21) Packers: Jimmie Ward, SS, Northern Illions – The Packers must fill their secondary in first round. 22) Eagles: Darqueze Dennard, CB, Michigan State- Best CB on the board at this stage. 23) Chiefs: Marquise Lee WR, USC- Lee fits the mold for Andy Reid and company. 24) Bengals: Jason Verett CB, TCU- Helps fill their gaping hole at CB position. 25) Chargers: Bradley Roby, CB, Ohio State- Chargers take full advantage of rich CB supply in 1st round. 26) Browns : Cody Latimer, WR Indiana- Speed reciever that Blake Bortles will love. 27) Saints: Zack Martin, OG, Notre Dame- Needs help on the O-Line. 28)Panthers: Morgan Moses, OT, UVA- Panthers have hole at WR &CB , but can’t pass up on Moses. 29) Patriots: Joel Bitnoio OG, Nevada – A true Patriot Way pick to the fullest..
30) 49ers: Brandin Cooks WR, Orgeon State- The 49ers need another wide-out to help Kap. 31) Broncos: Ryan Shazier OLB, Ohio State- The Broncos need a physical line-backer and he’s the best available. 32) Seahawks: Austin Seferian-Jenkings TE, Washington- Another weapon for Russell Wilson and the defending Super Bowl champs.